If you’ve never grilled or barbecued quail, you really ought to give it a go. They are basically teeny chickens, with a delicate flavor and super tender meat. Even wild ones tend to be tender, although they are denser and more flavorful than domestic quail. 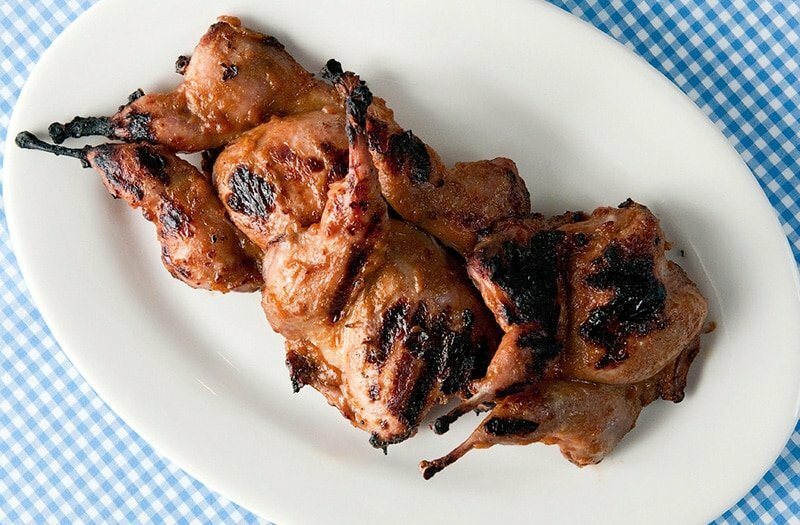 It’s classic outdoor party food: A pile of grilled quail, slathered in sauce, people gnawing away at them all over the yard, drinking beer, laughing. What’s not to love? Start by spatchcocking your quail. I know, that sounds dirty. But it’s really just a cooking term for flattening the birds. You use kitchen shears to cut out the backbones of the quail, then you flatten them with your hands so they cook evenly. I take the extra step of removing the ribs with a sharp knife and shears. The fewer bones the better. 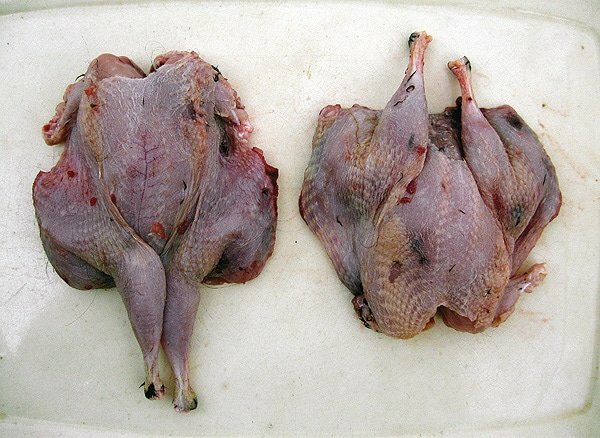 If you are buying your quail, you can often buy them “tunnel boned,” which means the only bones left in the birds are those in the legs and wings. When you are done, they should look like this. These are, obviously, wild quail, as they are a little bruised up from the hunt. Grilling them this way is easy. Coat with oil, salt well and slap on a hot grill. Start with the breast side up so you can cook the whole bird well without incinerating the delicate breast meat. Once that side is good and browned — a little char is a good thing here — only then do you flip it. Paint with the sauce of your choice and you’re good to go. Sauce is your big choice here. You could go European and just use olive oil, lemon, some herbs, salt and pepper. I do this a lot. Or you could go American BBQ and use your favorite sauce. 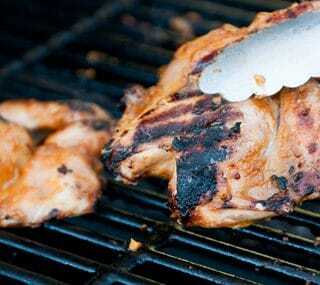 I have several barbecue sauce recipes over at my friend Elise’s site Simply Recipes. 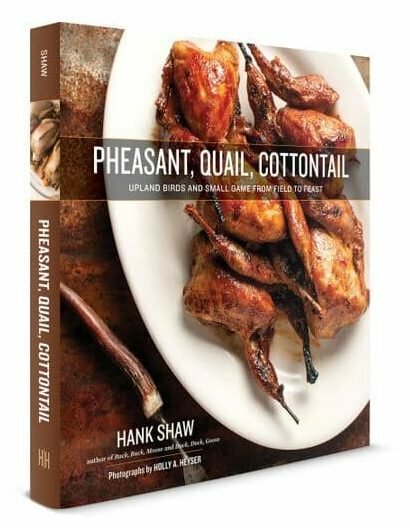 But if you have to pin me down, my favorite way to grill quail is with a mustard-based, South Carolina-style barbecue sauce. It is the perfect match for the quail. Break out more quail than you think you need when you make this. Normally two quail per person is a good portion, but I’ve eaten six at a sitting, and have seen otherwise demure young women gobble down four. And if they don’t all get eaten? No worries, as they are spectacular eaten the next day cold for lunch. I love barbecue no matter where it’s from, but I am especially fond of the mustard-based South Carolina style of barbecue sauce. Traditionally slathered over pulled pork, this sauce is good on anything. Use this sauce on barbecued pheasant legs, or on quick-grilled quail. Make the sauce first. Heat the butter over medium heat, then add the onion and sauté until it turns translucent, about 3 or 4 minutes. Add everything else, stir well and simmer slowly for 20 minutes or more. You can buzz it in a blender for a smooth sauce. To flatten the quail, use kitchen shears to remove the backbones of the birds by cutting along either side. Put the quail breast side up on a cutting board and press to flatten. If you want to be fancy, carefully snip out the ribs and the curved saber bones near the wishbone. Salt the quail and toss them in the vegetable oil. Get your grill hot and lay your quail breast side up. Grill over high heat with the grill lid down for 5 minutes. As it cooks, paint the breast side with the sauce. Turn the quail over and paint the cooked side with sauce. Grill the breast side with the grill cover up for 2 minutes, then turn over again and paint with the sauce one more time. Cover the grill and cook another 2 to 4 minutes. Take off the grill and paint with sauce one more time. Sam: As in can you can it? Not unless you pressure can it. It is not acidic enough to water-bath can.